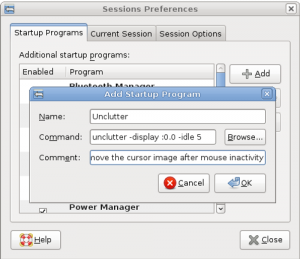 Auto-Hide Your Mouse Pointer When Idle With "Unclutter"
There was some recent discussion on one of the local User Group lists this week about “What is your favorite underdog OSS application?” This discussion brought out quite a few of the little never-heard-of applications, yet many of them have proven to be really useful! If you’ve never spent an hour or two poking around the less-popular section of the repositories you’ll be surprised what you find in there! unclutter removes the cursor image from the screen so that it does not obstruct the area you are looking at after it has not moved for a given time. Not anything too complicated about that. Now lets get it installed! Installation can be done by issuing the following command or clicking the link. You can find more options in the man page (man unclutter), but this should basically hide the mouse pointer after 5 seconds of inactivity on your default display. Does the pointer always come back properly? I’ve never used this, but I know the pointer used to disappear while I was idle in Firefox, and then it’d refuse to come back. I started using Compiz’s water plugin to find it again. Wow that was right what I was looking for. Always wondered if I could make the pointer disappear when typing like it was in Windows XP some years ago. Just a nice option: -keystroke makes the pointer disappear only when you type something. 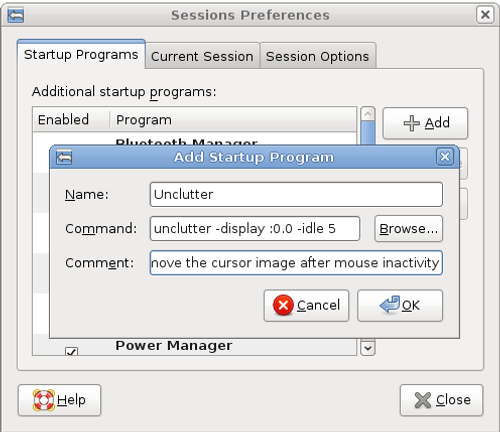 I’d like to use this in Xubuntu, but the Sessions thing in XFCE doesn’t have the Add feature. Oops! I typed too soon. There’s a Settings gadget called “Autostarted Applications” that seems to do the job. Little things that make me happy. Thanks for this. It works in all most windows (but not, for example, in this very dialog in Firefox as I’m typing :-\ But it mostly works and that’s an improvement. Only needs “unclutter” as the command in all common cases, 5 is the default according to the man page. The tutorials like this one are my first reason why I like Ubuntu and adore the community!